The United Nations has designated the first Monday of every October as World Habitat Day to promote sustainable development policies that ensure adequate shelter for all. World Habitat Day 2018 is the occasion to raise awareness on the importance of ensuring that vulnerable populations, especially the homeless, are adequately housed. World Habitat Day celebrations consist of "Women Without Walls" Exhibition in association with Cafe Art. 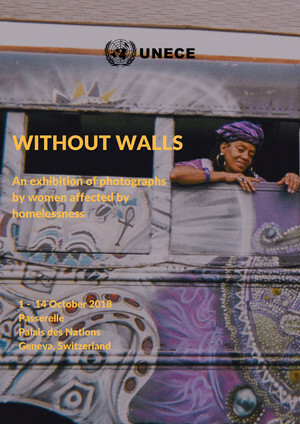 The exhibition highlights the need to alleviate homelessness through the implementation of the 2030 Agenda on Sustainable Development including the Sustainable Development Goals and the Geneva UN Charter on Sustainable Housing. This exhibition focuses on women experiencing homelessness and illustrates the specific needs of these women and why a gender-neutral approach often fails to support women. This exhibition aims to illustrate the link between Sustainable Development Goal 11: Make cities and human settlements inclusive, safe, resilient and sustainable and Goal 5: Achieve gender equality and empower all women and girls.